So, what did I get in the week of Sunday, August 13th to Saturday, August 19th? Two trades, one from Madalyn (STD) and one from Shannon (TBQ)! 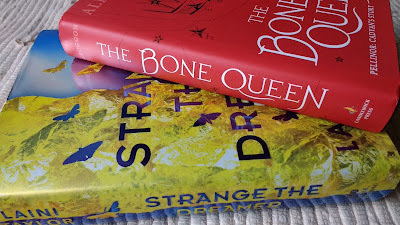 I've read and loved Strange the Dreamer, and The Bone Queen is for my sister. She loves the series! Well hello there... I did not expect this in my mailbox! 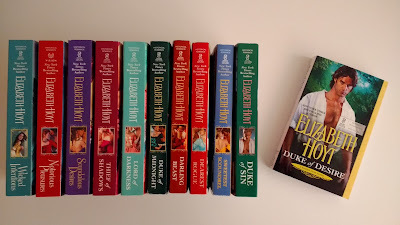 Check out my collection of Maiden Lane books! Now I've got one more. I'm excited to read this new one! I won Penguin Teen's Twitter giveaway! 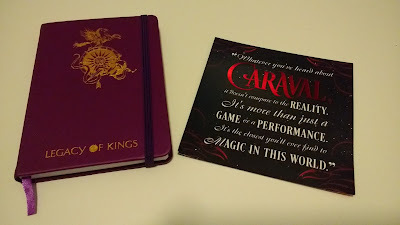 Most of you know that I am a huge Cashore fan... oddly enough, I never owned paperback copies of the Graceling Realm books. Now I do! A trade with Shannon (a different Shannon)! Thank you, lady! I just love that notebook. Thank you so much, S&S! I'm so excited about all of these! Especially The Becoming of Noah Shaw. This week was not bad at all! I had a productive week at work and on the blog, behind the scenes. I'm really excited about the eclipse on Monday - I even bought the solar sunglasses! Hopefully nothing adverse happens though. Baltimore is only experiencing the partial, but that's okay. It'll still be neat. I hope everyone has a lovely weekend! The eclipse has me geeked for it, too. Neat stuff in your haul this week. Love seeing your Maiden Lane collection. Nice other reads too! Have a few of these requested on Edelweiss as well, but they're so slow to get to my requests. It's aggravating. Especially since I'm usually rejected in the end anyway. But oh well. I have plenty to read until these books release! That's what I always tell myself anyway! LOL! And yay for the eclipse! I'm actually in the path of totality! I still have to work, but I plan to step outside during the times of partials and total-ness! Got my glasses after a long search too! I saw them earlier, but for the life of me can't remember why I didn't buy them then and there! Must have left my wallet in the car or something! Lol! Thank you!!! I probably fangirl way too much when it comes to Cashore and her books. :D I really hope you get approved for the books! S&S takes foreverrrrrrrr - it's been at least a month, with those three. So frustrating! I'm working too, but my office is going on the roof (it's a six-story building) to catch a glimpse! I wish I were in the path of totality, but that's okay. Enjoy! Nice haul, I have strange the dreamer but haven't read it yet. It's a good one, Carine! Awww! That's okay, you're the safest of all of us. :D I hope your class goes well! Happy reading and have a wonderful week. Thank you so much, Geybie! That is so nice of you. <3 I hope you have a great week too! Enjoy the solar eclipse!! I always avoid looking at it when the chance comes, even wearing the glasses. I'm paranoid about becoming blind - which is a long story and kinda weird, but yeah! I like it a lot! The trade was satisfying for both of us. I totally understand your paranoia! I cannot wait for the eclipse as well! We got ourselves some solar glasses to see it ad took the day off from work. We don't want to miss it! Great haul this week Alyssa! The Noah Shaw book reminds me I need to pick up the 2nd book in the Mara Dyer series. Enjoy the weekend and the eclipse! I wish I could have taken the day off! I'm too new to do that - it's okay though. The entire office is going upstairs when the eclipse rolls around. :D I need to reread the Mara Dyer series stat! 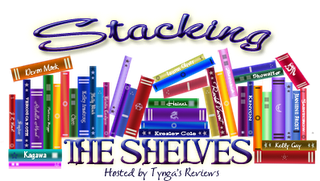 Some of them are ARCs! I managed to get paperbacks of most of them but still have to replace some of the ARCs. I love the series so much. =) Compromised in Paradise was very good! I'm very curious to read Jane Unlimited, I'm tempted to request it but I'm really trying to cut back on review books. I'll definitely be watching for your review! I know what you mean! I think it's on NetGalley now. I'll be reviewing it very soon! Love your awesome selection of books this week. I hope you love all of them. 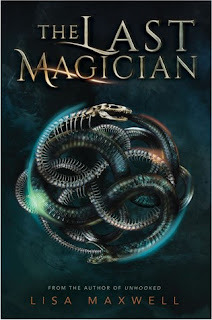 I bought a copy of The Last Magician a few weeks ago. I've heard pretty good things (but a few "Meh" comments so we'll see). I'll be working during the eclipse and admit I'm not that thrilled about it. Have a great week! I've heard a loooooot of meh remarks! I've not read it yet because of those reviews. I may binge-read the series when book two publishes. Wow! Lots of great books you got there, especially Strange the Dreamer! I hope you enjoy all your books! Thank you so much, Ronyell! Nice mix in your haul. Love productive weeks. Happy reading. Thank you, Velvet! Same to you! 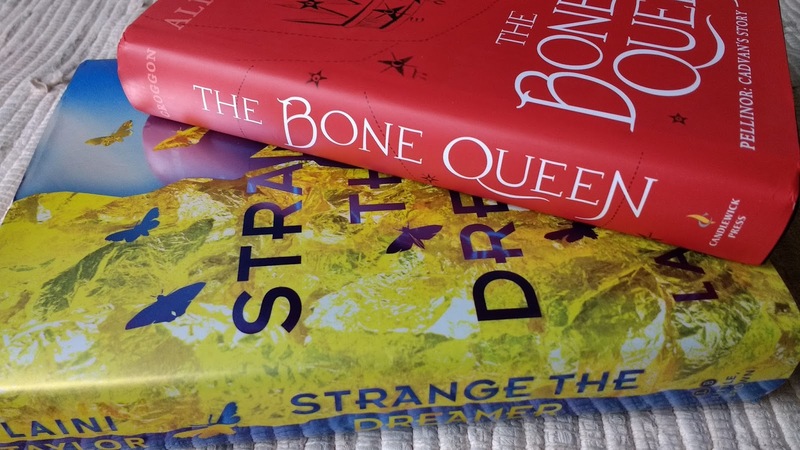 The Graceling books and strange the Dreamer both look great! 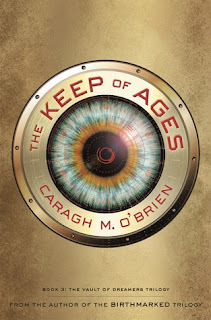 And I LOVE that cover of The Keep of Ages. Right?! 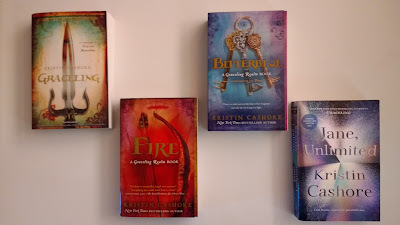 I love the Graceling Realm series, and not just because of the covers. :D The Keep of Ages was really good, Greg! Ooo that's super exciting about the Kristin Cashore giveaway! Congrats on winning! :) The Chaos of Standing Still looks great so I'll be curious to hear your thoughts on it. Happy reading, and have a wonderful week, Alyssa! Thank you so much! I feel like I never win anything anymore, so it was so exciting. I've had good luck with Jessica Brody's books in general, so I'm excited about this new one. Thank you, and you too, Lauren! Great haul this week! Congrats on winning that giveaway too! Hope you have an amazing week! My husband got to go back to WY for the ecplise to see it in its full glory. I'm jealous. PA is probably getting something similar to Baltimore. I'm curious about Jane, Unlimited. I have it on hold at the library. Great haul this week! Happy reading! WOAH! That's awesome! Yup, we won't see much, but that's okay. :D I hope you enjoy Jane, Unlimited when you read it! Thank you! What a great selection you have here of the Maiden Lane Series. I own some in paperback and some on my kindle. But I just love all of the covers. I always love getting those surprise books in the mail from publishers since you never expect it until it happens. I got The Becoming of Noah Shaw too and I am ridic excited! Cannot wait to dive into that one. Happy reading! OMG, Alyssa! I got Noah Shaw because of you! I mean, I requested it because I saw your tweet about it some time ago, and then I read this post (in my inbox) and since I requested it probably the same day you did, I went to Ew to check if I was approved (I don't notifications) and I DID. I'm so happy I might cry. I want Empress!!!! But great haul this week, I hadn't heard of The Books of Pellinor! OMG I'm so excited for The Becoming of Noah Shaw! The series was one of my favorites so I'm excited to get back into this world! Sounds like a great haul of books this week. Enjoy them! Have a great week! Ooh lots of fun things in the mail, and congrats on the twitter win!